I'm so pleased to see this work! Very nicely done, and shown Steve! Thank you kindly MM friends! I have to admit I'm not merely glad to have finished a project this time, I'm greatly relieved to have!!! Now if the tractor will only run after I get it back together! For sure Andrew, careful cleaning all around before trying to reassemble parts. I've been thinking about this this all evening, and because forums are visited by all sorts of people, many beginners, etc. who might take this as a general okay, I just want to add here that using super glue to machine on a mill is definitely NOT usual or the proper way to clamp for machining. I did it because I felt I understood what the forces on the glue joints would be for this very specific instance, with these specific parts, with their specific orientation, with the cutting direction of the mill head, and with the pressure I would apply by hand and depth of cut, and that I wouldn't exceed them. It was very important to me to be able to listen to the cutter and feel the cut proceed, and I was very careful to adjust my speed continually to what it "felt" like. Even then there were no guarantees, it was my own personal estimate, and I did try it out on the bearers first as an experiment. So don't go thinking that just gluing anything down with super glue will work -- it most likely won't, with more or less disastrous results. Super glue is quite shock sensitive, especially along the glue line, and there's a fine line between the forces of an interrupted cut breaking that line, and having it hold for surfacing. The fact that I could easily release the part with some taps of the hammer in the right place should make that clear. Clamp securely and in accepted milling practice fashion with mechanical clamps, and work safely. I would certainly have used mechanical hold downs on this job if I could have. Those valve caps should be an over the counter item for peanuts. Loads of engines use then and valve stem diameters fall in a narrow range so the choice should be wide. Fordson Major, Power Major, and Super Major all use them and spares are widely available. I have a question: How much in total you skim off and do you need anew thicker gasket? Once we read on old tractor shop manual and it had a chart and sparepart numbers, tabulated on "deck height" or whatever it was that describes the "loss". Hi Pekka, I took off a total of .014". I think that will be okay because on an old tractor there aren't many fixed parts that also attach to the head whose dimensions would no longer work. Also I'll know when it comes time to adjust the valve clearance if there's a problem. Of course the head was already low in the center by .012" and may have been bent down by the head bolts. So, anyway, I think there's a good chance that there won't be mechanical interference problems. A little more compression maybe. But I'm hoping the additional two cylinders firing I get out of it will be an improvement, no matter what the problems! Andrew I'll try to find those then. A check on the internet earlier showed only the whole lvalve keeper assy - for about $30 plus $20 shipping. 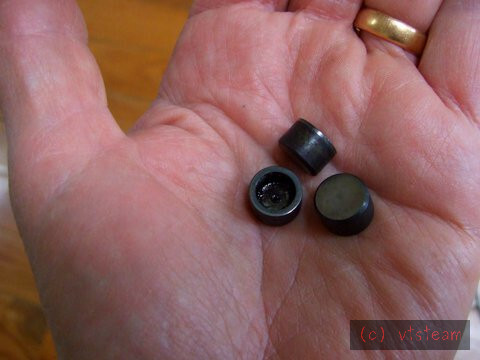 Damned if I'm going to spend $50 for a simple part the size of an unthreaded nut! Is it the hardened little cap that sits on top of the valve? Dead easy to make! A bit of tool steel "reclaimed" annealed from an old chisel or something! Tempered dark straw at a guess. That way your sure to find the one you lost! Here are the three exhaust valve caps that I have. I'm starting to wonder if there actually were 4 on this tractor when I got it. I just noticed that one of the valve pushrod ball ends is dirty and varnished over, while the other 7 are shiny. Was that rod even contacting? When fitting, according to the Ford Service Manual the end clearance inside the cap should be .002"-.004" and you shorten the cap to fit the valve. Steve,I think Pekka may be reffering to the thicker head gaskets that are prescribed when a diesel cylinder head has been skimmed. These thicker gaskets are used to ensure the bump clearances and compression remain in spec on diesels where compression height tolerances can be fairly tight. Yours being petrol and in the region of 6:1 ratio isn't going to be negatively affected by 15 thou reduction and the associated rise in compression ratio.....OZ. Steve, I was thinking along the same lines a couple of days back about the missing valve cap and wondering if the missing cap was the cause of the engine not running on all cylinders. Was the head gasket physically damaged when you inspected it?.....OZ. Oz it was blown in the middle between 2 and 3 cylinders. Of course a bad valve could have been in that area, too. Sorry I didn't note what looked like what when I pulled the head and valve gear. The big gasket break was what caught my attention. I guess if I do end up tryi ng to make another cap, the trick will be the .350" bore and flat face inside. Might have to actually make a rose cutter or something to cut that. Had another thought about that dirty pushrod end.....ugh... hope there's nothing wrong with the cam and lifter. When I took the rocker cover off my old 1954 Fordson Power Major years ago to cure an oil leak, at first I thought someone had fitted a wrong push rod as one rocker was at a significantly different angle from the rest. I then noticed that the valve cap was missing. Had to get on cutting the field so it went back 'as was' and I used it for four years like that with no issues. Totally forgot about it until just now. I'm not surprised Andrew -- I read somewhere that the caps were an after sale addition -- recall style, on some of the earlier engines to prolong exhaust valve life. Mine I believe is one of the earliest 800 series tractors -- serial number is only in the 9000's). I believe the 800 series (mine's an 850, meaning it has a 5 speed transmission instead of a 4) was the beginning of the 172 Cu in engine -- earlier engines were 134 CI. So anyway, I've heard of engines without them, and others where people took them off for some reason. Anyway, though that all may be true, I think I'll try to get 4 of those rotators back in the engine one way or another. I have a lead on a local guy who works on tractors, and might have one. The big tractor dealers have all closed in this area over the last 5 years. That worked well. I would never have dared to mill it with superglue clamps. I think I'd have been putting bolts through the valve holes. Do you have a part number for the missing part? Is this any help? Make a miniature boring bar. 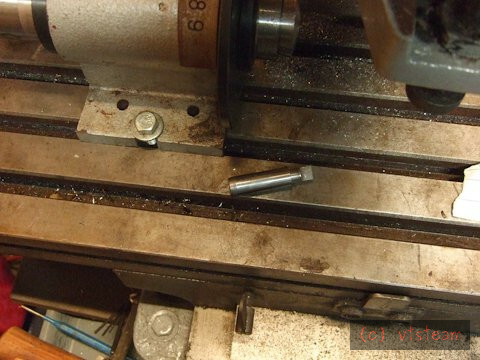 The flat bottomed hole, use a modified two flute end mill as a boring bar, face off the bottom of the hole from the centre. Russell I got the idea from a description by Tubal Cain in his book "Simple Workshop Devices" where he describes turning washers to thickness on a faceplate, adhering them with Turner's Cement -- in that case resin and beeswax. After turning to thickness, they are released with a rap from a mallet. I know I've read somewhere else, probably online that super glue has been used for something similar in more recent years. After milling the test sand casting with the new fly cutter I had a feel for what a 5 thou cut would feel like with this rig. It was a very light tapping of the casting -- not a great deal of force. After wrestling the head onto the mill, it seemed like the weight and inertia of the head alone could almost resist that force -- I thought that if I could just stop it from sliding with a positive stop, or having it lift, it would take care of itself. Since the head was a lot longer than it was tall, I figured a line of glue tacks along that direction would do both. Kind of like putting a heavy weight on top of a bench and trying to push it lengthwise on grass. You can't, even though grass has negligible strength. The front legs are immobile. The bench will only pivot upwards at the pushing end. It can not slide. It doesn't take much friction to prevent sliding, which is why wheels were invented. Super glue basically increased the "friction" of the milling table. It is strong in tension, so the glue under the near end only has to resist upwards pivoting forces - and those are low because the glue and bearers are directly under that end. Not much of a lift vector. There was almost no overhang. Plus a very light cut. And the glue at the far end only has to act as friction. Like a trip or a stop. Well it was dotted with glue all along its length, too. Anyway, I estimated it would work. And as a test I surfaced the bearers -- they have much less mass to absorb the milling forces. And they held. So adding a big heavy mass of cast iron on top of that could only improve "friction", down force at the ends, and standing inertia. I don't think any of the glue spots felt much force at all. Of course when I took a hammer to the bearers from the side (not down the length, which lines up the glue spots) super glue's poor resistance to shock loads made it release. Anyway, that's my story, and I'm sticking to it! Maybe just a homemade square ended D-bit would do it, after drilling undersized? Or a drill bit ground straight! Too late! 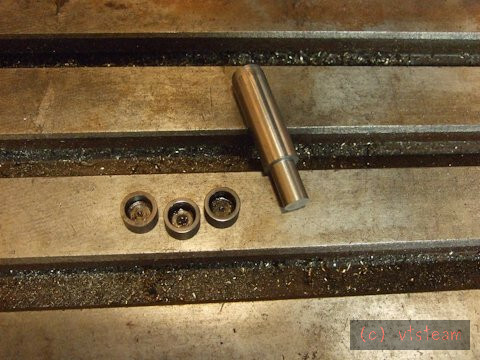 I had already headed out to the shop and started to make an olde tyme slot drill. Now I want to see if it will work! Turned the endd of some half inch drill rod to .350"